Can begin to change the world. It is all kicking off. To FIFA – look at that corruption! Surely a yellow card there? But no – the referee waves play on. Inequality to bring tears to the eyes. £13bn for stadia but nada for the people. Movers and shakers are in the royal box. But where are the slums, the homeless? Nowhere to be seen in sanitised coverage. Clash with the millions occupying the squares. We are not in control of the footage. The samba, the passion, the silky skills. Football and beer numb the pain of life. There is a world still to play for. We still have a chance to equalise. That a sperm whale was beached, due to plastic debris. Not on plankton but on sheeting, meant to grow tomatoes for our tea. But we must all be aware of the whale’s sad plight. Should make us all weep and wail. And found 59 items of plastic in its stomach, all in disarray. But most revolting of all was the stench of money. Exotic fruits can’t be grown al fresco. So greenhouses use lots of plastic sheetin’. Never more to lash its ugly and mighty tail. To make sure they did the right thing, never mind any losses! The people were angry and put up a good fight. Will the supermarkets ever listen, or care about our seas’ plight? Resolved to change this messed-up system, with civil unrest. To fight for a decent future for all, is that such a naive thought? And so I will conclude this awful and terrible lay. To protect our seas, no more whales to be beached. 10,600 and counting . . . the hardest hit. In the UK, the Freedom of Information Act allows people to ask questions of public bodies. One such question put to the government by anti-disability discrimination campaigners, asked between January and November 2011, how many people have died after being assessed by ATOS as being ‘fit for work’ in a six week period since their assessment? In 2010, there were just 310 deaths of people on health-related benefits. The answer supplied by the DWP to the FOI request was 10,600 deaths. This graphically illustrates the stress and financial impact that disabled people are suffering from as a result of government outsourcing and a target-driven culture that does not meet people’s needs, but only seeks to cut costs, in this case even at the cost of human life. We call for an end to ATOS assessments. We call for democratic decision making and the involvement of disabled people themselves. We call for decent benefits to allow disabled people to lead as independent a life as possible. All outsourced services should be brought back under the remit of a democratically-controlled, publicly- funded NHS. The ideal of universal healthcare is rapidly being demolished under the present Government’s Health and Social Care Act, while New Labour introduced the ‘reforms’ – Foundation Trusts, PFI and outsourcing, which made these attacks on our healthcare system possible in the first place. We are campaigning for Leicester Council to refuse to implement the discriminatory and unfair bedroom tax, which affects disabled people disproportionately – around two thirds of the tenants affected by this tax are disabled – they often need a spare room due for a carer or for equipment due to their disability. “You can judge a society by how it treats its most vulnerable citizens”. “From each according to their means, to each according to their needs”. You can read some of my poetry in my book ‘Little Red Poetry’. All proceeds go to build a new party for ordinary people, against cuts and privatisation. Is this the extent of our democracy? A snippet of a single on the radio? And celebrate the big day. ‘Cos she stole our kids’ milk. Pensioners are dying in their homes, when they lived through the Blitz. Victims of fuel poverty, privatised energy. Lost jobs, empty factories, homeless on the streets. I was seven when she came to power in 1979. Said the unions wouldn’t stand for it. I will be performing some of my poems at the Donkey pub, on Welford Road, Leicester on the 3rd October, 8pm – saying ‘Goodbye to Thatcher’. The excellent KGB Jazz and The Splitters are also playing, and Bali Rai will also be reading. Tickets available here – http://www.ents24.com/leicester-events/the-donkey/kgb/3486723. All proceeds go to City of Sanctuary. The news spread fast – by squawk, coo and twitter. Synchronised starlings swept across the sky. Militant seagulls cried out in anger. Gathered in Grantham to give up their guano. On the day the statue of Thatcher was unveiled. We circled high until the ribbon was cut. Covered her from head to foot in our ordure. Just as she broke our communities. I will be performing some of my poems at the Donkey pub, on Welford Road, Leicester on the 3rd October, 8pm – saying ‘Goodbye to Thatcher’. The excellent KGB Jazz and The Splitters are also playing. Tickets available here for £3 – http://www.ents24.com/leicester-events/the-donkey/kgb/3486723. All proceeds go to City of Sanctuary. We’re fracking, we’re fracking – I’m gonna frack it with you. Like an atom bomb, about to oh, oh, oh, oh, oh, explode. Two minutes to midnight – the hands that threaten doom. One, two, three o’ clock, four o’clock, rock! You – shook me all night long! Sharia don’t like it – rockin’ the Casbah, rock the Casbah. And I’m a heatseeker, gonna burn up your town. Frack, baby, frack, show me you’re real. Get up, stand up! Stand up for your rights. Don’t stop me now! I’m having such a good time. Come and do the jailhouse rock with me. Let’s rock! I stand in front of you, I’ll take the force of the blow. Notes from Tommy Sheridan’s speech at the National Shop Stewards Network Conference, Saturday 29th June 2013. Tommy had been to 73 meetings all over Scotland, where 80 local anti-bedroom tax capaigns have been set up. Affiliations from union branches and trades councils had been built – it was necessary to put demands on the official movement. The Scottish Trades Council is hosting a conference against the bedroom tax. The anti-bedroom tax movement is growing. Tommy said he was not personally affected, but he was personally offended by the bedroom tax. “You stand with me, I’ll stand with you” – is the motto of the movement. He gave the example of a couple in Inverness – one was suffering from multiple sclerosis, and had to be confined to a wheelchair as a result. Her husband gave up his job to be a full-time carer, saving the state £10,000s a year. She has a special bed, which she needs for pain relief, so they have to sleep in separate rooms. They are now being asked to pay £60 a month from their benefits in bedroom tax. 2,000 families affected in Inverness – the number of council homes available is 164. Likewise, an amputee has an elderly mother who is 78 and suffers from Alzheimers, so had to move to a care home. They are now deemed to be under-occupying, and are being asked for £60 a month. 5,300 families affected in South Lanarkshir. Number of homes available – 40. Housing benefit is means tested, therefore it is the poor who are suffering the most from this tax. 660,000 people affected across the UK; 2/3 of these families have a disabled person in the household. I would just add that we also need to campaign for massive investment in affordable council housing to meet our needs. This would also provide jobs for the thousands of building workers who have been made unemployed by the property crash. Otherwise, more and more families will find themselves on the streets in breadline Britain. It is no use just blaming the Tories and waiting for a Labour government. Labour have made it clear that they will not reverse the cuts made by the ConDem coalition. We need to build an alternative party, to stand up for ordinary people and not the rich. I support TUSC in its attempt to do just that. We are the paymasters. Wake up. 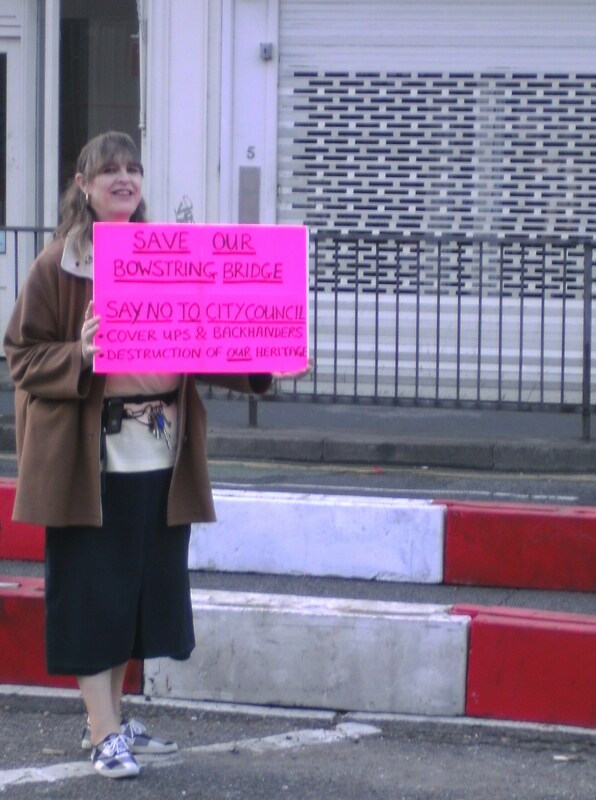 Protesting against the demolition of the Bowstring Bridge and Pump and Tap pub to make way for a swimming pool attached to De Montfort University. The council are selling the land for a measly £1 to DMU. They claim it is necessary to make way for a swimming pool, although why they can’t keep the bridge, the pub and build a pool somewhere else is beyond me. The hypocrisy of the situation is that the council closed St Margarets Baths and done nothing to replace it for over 10 years. The bridge is a landmark as you go into Leicester, and is part of the Great Central Way. Why should the council knock down what little is left of the city’s heritage? The answer is in the picture below. We need to campaign for a genuine, democratic alternative to the sleaze and corruption that infests politics at the moment. At least in Leicester West, come the next election, the Socialist Party may well be standing to offer an alternative to the three main parties of sleaze, spin and corruption.